VR & AR – What’s Real? What’s Hype? What’s the Future? What’s the real state of the VR & AR industry? We recently talked with senior representatives from Google and SuperData Research to ask who’s succeeding, where the technology gaps are, what’s holding back faster adoption, and where the biggest opportunities are arising. 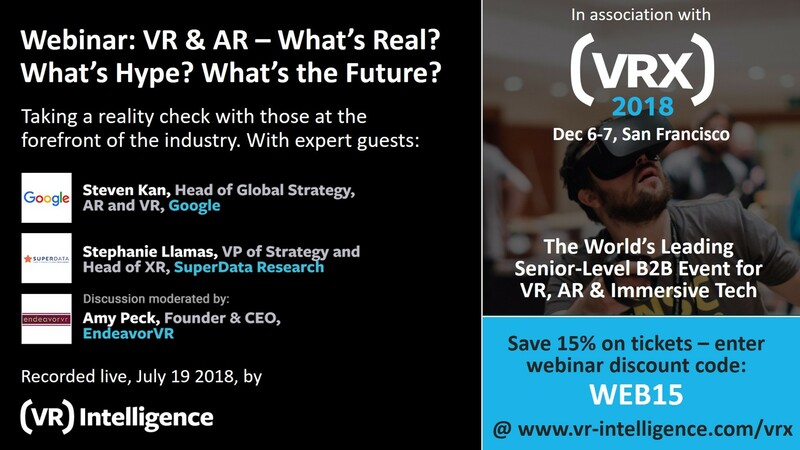 What’s really happened with VR & AR in the last 12 months – and what’s the real 2019 outlook? Where are the primary technology gaps - and what areas are we seeing big progress in? Virtual consumers: Who are they? What do they want? What’s getting big consumer attention - and why? Which business applications do VR & AR lend themselves best to? Where are we seeing early successes? I hope you enjoy the webinar recordings - please let me know if you have any feedback, or if you want to get involved with the VRX 2018 event.